Last week, The Chemical Brothers released their eighth studio album, Born In the Echoes, to an overwhelmingly positive critical reception. Now, however, the fun is just getting started. 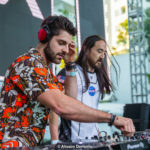 Ahead of performance dates at HARD Summer, Creamfields, Electric Zoo and more, the big beat legends are rolling out some finely-tuned remixes of their album singles. Today, The Chemical Bros unveiled the newest piece of the puzzle: Claude VonStroke’s official remix of “Go.” It’s hard to fathom the awesomeness of such an occurrence. Melding the creative tendencies of Dirtybird’s head honcho with new material from The Chemical Brothers is about as cool as things get these days. As you’d expect from VonStroke’s recent studio output, his remix of “Go” is dexterously on point. Constructing a tight-knit, hip hop-savvy drum kit, it bellows with low bass rumbles and ticking percussion, providing the perfect foundation for Q-Tip’s well-cut vocal lines. The full “Go” remix bundle is available on Spotify now.